Home » » Announcement of Alaba to Arsenal. Announcement of Alaba to Arsenal. 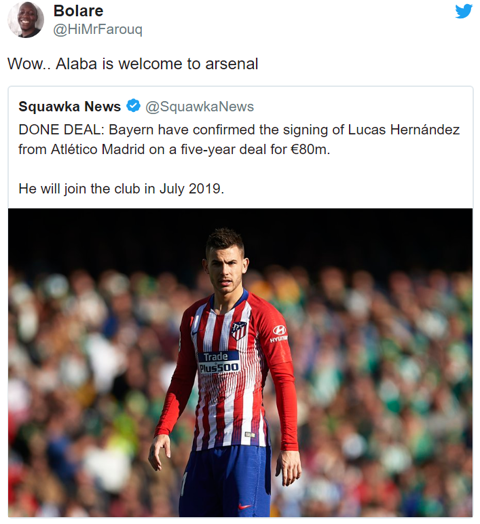 Arsenal fans seem pretty excited by today's news that Bayern Munich have signed Atletico Madrid left-back Lucas Hernandez. The Bavarian giants have confirmed the deal on their official site today, which will go through in the summer in time for next season. The question now is – what next for Bayern's current left-back David Alaba, who's, you know, pretty good too? The Austria international has been one of his side's most important players for many years now, winning a host of major honours at the Allianz Arena, including playing a part in the 2012/13 treble win. 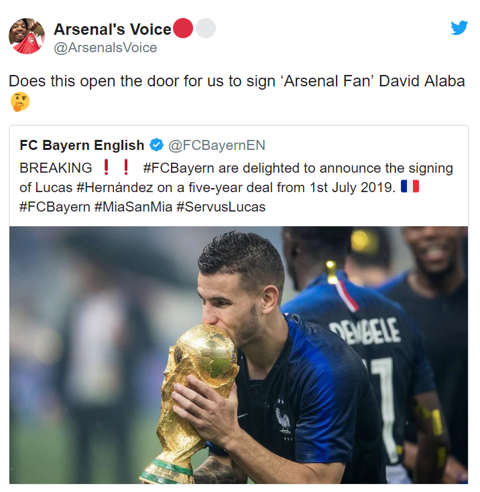 As noted by Goal, Alaba has also confessed to being an Arsenal fan in the past, so could the arrival of a new left-back lead him to the Emirates Stadium? While it's obviously not as simple as that, these fans are hopeful that this could be a good time to make a move for the player, who will undoubtedly face more competition for his place than before. Unai Emery could really do with a player like the 26-year-old in his ranks, with Nacho Monreal ageing and Sead Kolasinac not really good enough.